Everyone Thinks That They’re A ‘Responsible’ Person. Where Do You Stand? Author Christine Hemingway explores the topic of responsibility, and introduces us to the Corporate Social Entrepreneur. From time to time, everyone talks about their responsibilities. Whether it is looking after children, or elderly parents, or responsibilities to our siblings, or to our friends. For the majority of us, these responsibilities – and paying our household bills – are the limit of our everyday experience of our personal responsibility. For many others, responsibility can reach more broadly than these immediate, personal concerns and may extend more widely to neighbours, to fellow members of a club, to helping the local community, or to proactively helping the environment, for example. For some, their perceived responsibility can extend even more widely than this and their activities will include helping others, even where there has been no previous personal or family connection to trigger their involvement. Of course these boundaries can shift as our circumstances change. But for some people, helping others who are not part of our immediate family can be more than just a rare occurrence. So where do we, personally, draw the line? Perhaps we might think of our responsibilities in terms of a series of concentric circles with ‘Me’ located in the centre and then partners and immediate family members situated closet to the centre, followed by other groups of people, such as colleagues or club mates or neighbours plotted further from the centre, reflecting our perception of where our responsibilities lie. People will plot their responsibilities differently. Some may place children and ‘Me’ together, with their partner second; others would place partner and children as closely as their responsibility to themselves. For some, children are a lower priority than their partner and their work. 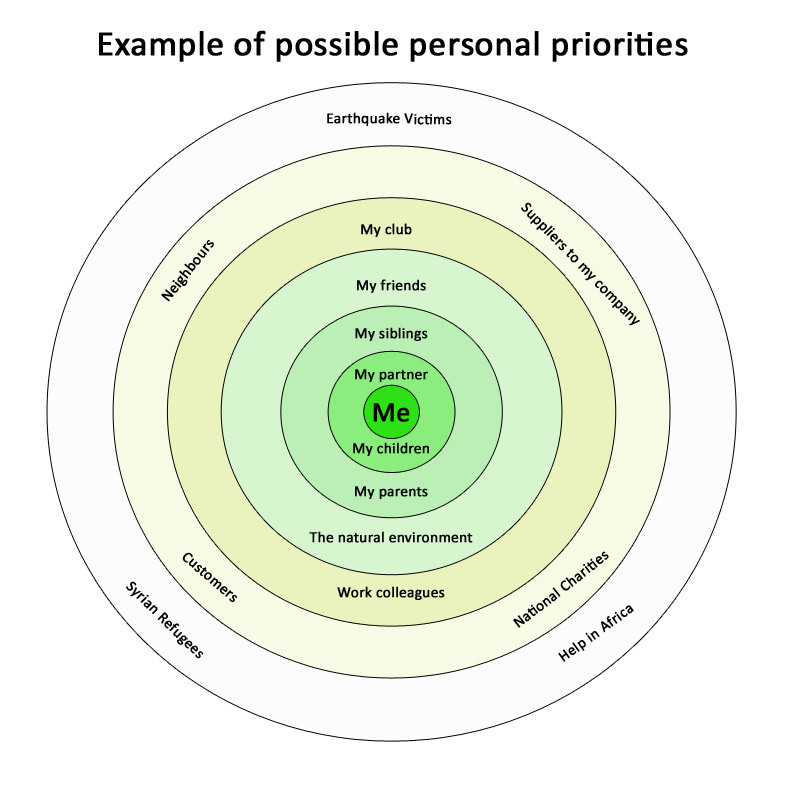 Diagram showing an example of possible personal priorities. This is not a judgement about what we should do. My research is concerned with what actually happens. But what about our priorities in the workplace? Do these responsibilities really change? I don’t believe that they do. As an academic working in the field of organisational behaviour, my perspective on how people behave when they are at work was based on my own experience of a prior career in corporate management and before this, the public sector. This supported the findings of the management researchers who have refuted the reductionist notion of the rational, values-free manager. Next, my task was to empirically investigate this idea and so I conducted exploratory, ethnographic research within a UK-based multinational corporation. I began by targeting employees with a reputation for prosocial behaviour at work, regardless of their job function and level of seniority. What I found was four, basic personal stances towards corporate social responsibility. The dominant mode were ‘Conformists’, some of whom were involved in CSR as part of their job, with an environmental or health and safety role and some of whom had no involvement. For this majority, their concerns were articulated as dominantly self-interested and getting involved in CSR only if it were required of them. A second mode, ‘Disassociated’, dissented the view that CSR was a necessary or viable strategic direction for the company. The third and fourth modes represented the corporate social entrepreneurs (CSE), some of whom were more vociferous than others regarding their social and/or environmental agenda. 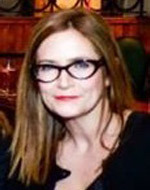 For example, the ‘Concealed’ CSE had a reputation for prosocial behaviour, but this was tempered due to the perceived constraints at work. Lastly, the ‘Active’ CSEs were responsible leaders: socially entrepreneurial champions who operated at a number of levels within the hierarchy; from shop floor up to the executive suite. The CSE is the same thing as a social intrapreneur. And my proposition is that these results could be generalisable across different types of organisations, industries and cultures. My message is that the ‘Active’ CSE mode represents a minority who operate as responsible leaders, regardless of their job role and their working context. So my research demonstrates that leadership is not necessarily confined to the top of the organisation, at the most senior levels. The task of a responsible organisation is to facilitate the development of these corporate social entrepreneurs and give them the space and the resources to operate and galvanise further support for their projects.